This right here, this is summer. A crazy simple fruit crisp cooked outdoors on the grill. Ideally it should be eaten outside, either for dessert or for breakfast, and you should be wearing a sundress or shorts or a swimsuit while you eat. You should devour the entire thing yourself without a bit of guilt, or share it with someone you love straight out of the baking dish. You should top it with a little yogurt, or maybe a little ice cream. You should savor every last drop of sweet, juicy fruit with a smile on your face and the warm sun on your skin. Because this is summer. I’ve made this fruit crisp for breakfast more times in the past month than I should ever admit, so I can say with certainty that it works with just about any combination of summer fruit (fresh or frozen) that you can think of. 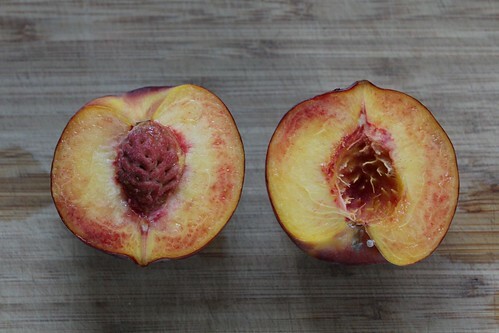 The peaches and blackberries that I use here just happen to be my favorite combo. The topping can be adjusted to suit your tastes and whatever ingredients you happen to have on hand. I change it up a bit nearly every time I make it, and I only measured the ingredients so I could post the recipe here. Finally, if you don’t have access to a grill you could certainly bake this in the oven at 375 degrees or so until the fruit is nice and bubbly. 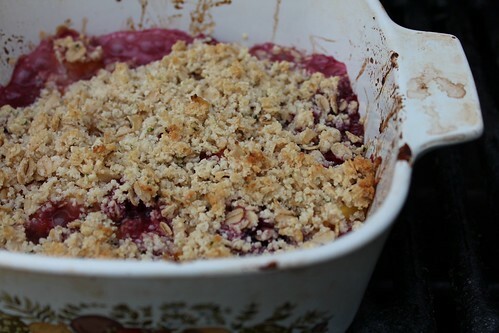 Combine the peach pieces and the blackberries in a small baking dish and set aside. In a small bowl combine the almond meal, oats, sugar, hemp seeds, and salt. Stir to combine. Add the coconut oil and stir again until the ingredients are well mixed. Spread the almond meal mixture evenly over top of the fruit in the baking dish. Transfer the dish to the grill and allow to cook on the covered grill for 10 to 15 minutes, or until the fruit is bubbly and the topping has started to turn golden brown. Aren’t hemp seeds the best? They’re my favorite add-in right now.